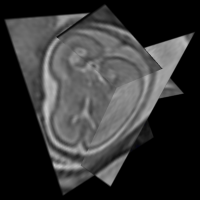 We have previously proposed the first practical approach to creating true 3D images of the fetal brain from in-utero clinical MRI data using registration of multiple slice-stacks. In this project, we have developed improved approaches to recovering motion trajectories and methods of forming improved resolution MR images from the clinically collected image data. K. Kim, P. A. Habas, V. Rajagopalan, J. A. Scott, J. M. Corbett-Detig, F. Rousseau , A. J. Barkovich, O A. Glenn, and C. Studholme, "Bias field inconsistency correction of motion-scattered multislice MRI for improved 3D image reconstruction," IEEE Trans. Med. Imaging, in press. K. Kim, P. A. Habas, F. Rousseau, O. A. Glenn, A. J. Barkovich, and C. Studholme, "Intersection based motion correction of multislice MRI for 3-D in utero fetal brain image formation," IEEE Trans. Med. Imaging, vol. 29, no. 1, pp. 146-158, January 2010. F. Rousseau, O. A. Glenn, B. Iordanova, C. E. Rodriguez-Carranza, D. Vigneron, A. J. Barkovich, and C. Studholme, "A novel approach to high resolution fetal brain MR imaging," in Medical Image Computing and Computer Assisted Intervention, LNCS, vol. 3749, pp. 548-555, October 2005. The fetal brain consists of a mixture of developing white matter (WM) and grey matter (GM) regions and transient tissue types related to brain growth. We have extended conventional approaches to adult brain segmentation by including these transient tissue types in the segmentation model and statistical priors. We have also created a statistical model of the developing fetal brain that aims at capturing its unique laminar structure. This allows us to accurately delineate various types of developing brain tissues from reconstructed fetal MRI with particular focus on the germinal matrix (GMAT), a deep brain region of developing cells adjacent to ventricles (VENT). P. A. Habas, K. Kim, F. Rousseau, O. A. Glenn, A. J. Barkovich, and C. Studholme, "Atlas-based segmentation of developing tissues in the human brain with quantitative validation in young fetuses," Hum. Brain Mapp., vol. 31, no. 9, pp. 1348-1358, September 2010. P. A. Habas, K. Kim, D. Chandramohan, O. A. Glenn, A. J. Barkovich, and C. Studholme, "Statistical model of laminar structure for atlas-based segmentation of the fetal brain from in-utero MR images," in Medical Imaging 2009: Image Processing, Proc. SPIE, vol. 7259, 725917, February 2009. P. A. Habas, K. Kim, F. Rousseau, O. 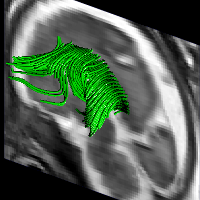 A. Glenn, A. J. Barkovich, and C. Studholme, "Atlas-based segmentation of the germinal matrix from in utero clinical MRI of the fetal brain," in Medical Image Computing and Computer Assisted Intervention, LNCS, vol. 5241, pp. 351-358, September 2008. Modeling and analysis of MR images of the developing human brain is a challenge due to rapid changes in brain morphology and morphometry. We have developed a spatiotemporal atlas of the fetal brain with temporal models of MR intensity, tissue probability and shape changes. Groupwise registration of manual segmentations of fetal anatomies at different gestational ages and voxelwise nonlinear modeling have allowed us to capture the appearance, disappearance and spatial variation of brain structures over time. Applying this model to atlas-based segmentation, we have generated age-specific MR templates and tissue probability maps and used them to initialize automatic tissue delineation in new MR images. P. A. Habas, K. Kim, J. M. Corbett-Detig, F. Rousseau, O. A. Glenn, A. J. Barkovich, and C. Studholme, A spatiotemporal atlas of MR intensity, tissue probability and shape of the fetal brain with application to segmentation," Neuroimage, vol. 53, no. 2, pp. 460-470, November 2010. P. A. Habas, K. Kim, F. Rousseau, O. A. Glenn, A. J. Barkovich, and C. Studholme, "A spatio-temporal atlas of the human fetal brain with application to tissue segmentation," in Medical Image Computing and Computer Assisted Intervention, LNCS, vol. 5761, pp. 289-296, September 2009. 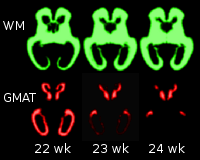 We have developed a dedicated image analysis framework for the detection of folding patterns during the critical period for the formation of many primary sulci (20-28 gestational weeks). 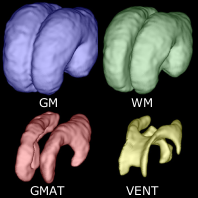 Using structural information from in utero MRI, we have performed morphometric analysis of cortical plate surface development and modeling of early folding in the normal fetal brain. First, we have identified regions of the fetal brain surface that undergo significant folding changes during this developmental period and provided precise temporal staging of these changes for each region of interest. Then, we have highlighted the emergence of interhemispheric structural asymmetries that may be related to future functional specialization of cortical areas. P. A. Habas, J. A. Scott, A. Roosta, V. Rajagopalan, K. Kim, F. Rousseau, A. J. Barkovich, O. 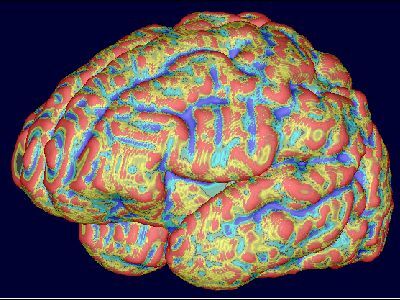 A. Glenn, and C. Studholme, "Early folding patterns and asymmetries of the normal human brain detected from in utero MRI," Cereb. Cortex, in press. P. A. Habas, J. A. Scott, V. Rajagopalan, K. Kim, F. Rousseau, A. J. Barkovich, O. A. Glenn, and C. Studholme, "Detection of hemispheric asymmetries during early folding by surface-based analysis of fetal MRI," 17th Annual Meeting of the Organization for Human Brain Mapping, Quebec City, Canada, June 2011. A. Roosta, P. A. Habas, K. Kim, J. Konkle, J. M. Corbet-Detig, F. Rousseau, O. A. Glenn, and C. Studholme, "Detection of early brain folding patterns of the normal human fetuses in utero," 16th Annual Meeting of the Organization for Human Brain Mapping, Barcelona, Spain, June 2010. DTI provides valuable insight into the developing brain anatomy. However, the correction of motion artifacts and susceptibility related local distortion in clinical fetal diffusion imaging is still a challenging problem. We have developed methods to build motion and distortion corrected 3D diffusion images, and ultimately to study the development of white matter tracts in the human fetal brain. K. Kim, P. A. Habas, F. Rousseau, O. A. Glenn, A. J. Barkovich, M. Koob, J.-L. Dietemann, A. J. Robinson, K. J. Poskitt, S. P. Miller, and C. Studholme, "Reconstruction of a geometrically correct diffusion tensor image of a moving human fetal brain," in Medical Imaging 2010: Image Processing, Proc. SPIE, vol. 7623, 76231I, February 2010. In this initial work with collaborators in pediatric radiology at UCSF we have been developing new methods of studying brain growth from clinical MRI scans of premature neonates. This work is aimed at building statistical models of both surface folding and local tissue volume increases in the developing human brain in order to create markers which can predict poor neurological development in premature babies. C. E. Rodriguez-Carranza, P. Mukherjee, D. Vigneron, A. J. Barkovich, and C. Studholme, "A framework for in vivo quantification of regional brain folding in premature neonates," Neuroimage, vol. 41, no. 2, pp. 462-478, June 2008. C. Studholme, C. E. Rodriguez-Carranza, V. A. Cardenas, B. Iordanova, S. Miller, P. Mukherjee, O. A. Glenn, D. Vigneron, and A. J. Barkovich, "A deformation morphometry study of the influences on the pattern of brain tissue development in premature neonates," in Proc. 11th Anuual Meeting of the Organization for Human Brain Mapping, June 2005. We use tensor based morphometric analysis of fetal brain MRIs to identify spatial patterns in age-related development of normal fetal brains. We have constructed "growth pattern maps" that allow us to develop a baseline of developmental biomarkers with which to correlate abnormal development. We also analyze growth rates of various brain structures allowing us to understand the correlation between development of these structures. The normal fetal growth pattern map developed here serves as a benchmark for later studies comparing growth pattern maps of abnormal fetal brain development with normal growth. V. Rajagopalan, J. A. Scott, P. A. Habas, J. M. Corbett-Detig, K. Kim, F. Rousseau, A. J. Barkovich, O. A. Glenn, and C. Studholme, "Local tissue growth patterns underlying normal fetal human brain gyrification quantified in utero," J. Neurosci., vol. 31, no. 8, pp. 2878-2887, February 2011. V. Rajagopalan, P. A. Habas, K. Kim, J. M. Corbett-Detig, F. Rousseau, O. A. Glenn, A. J. Barkovich, and C. Studholme, "Using tensor based morphometry to explore differential tissue growth patterns in normal fetal brains," 16th Annual Meeting of the Organization for Human Brain Mapping, Barcelona, Spain, June 2010. During normal brain development in utero, early cortical folding occurs according to a specific spatio-temporal schedule. During visual evaluatrion of 2D MR slices, fetal neuroradiologists have observed that the parieto-occipital sulcus is more shallow in fetuses with isolated mild ventriculomegaly (IMVM) compared with age-matched normal controls, indicating abnormal sulcation of this region in IMVM subjects. In this study, we have performed surface-based detection and mapping of these and potentially other delays in early cortical folding in young fetuses with IMVM. P. A. Habas, J. A. Scott, V. Rajagopalan, K. Kim, F. Rousseau, A. J. Barkovich, O. A. Glenn, and C. Studholme, "Detection and mapping of delays in early cortical folding in fetuses with ventriculomegaly from in utero MRI," 19th Annual Meeting of the International Society for Magnetic Resonance in Medicine, Montreal, Canada, May 2011. P. A. Habas, V. Rajagopalan, J. A. Scott, K. Kim, A. Roosta, F. Rousseau, A. J. Barkovich, O. A. Glenn, and C. Studholme, "Detection and mapping of delays in early cortical folding derived from in utero MRI," in Medical Imaging 2011: Image Processing, Proc. SPIE, vol. 7962, 7692O0, February 2011. P. A. Habas, K. Kim, C. E. Rodriguez-Carranza, O. A. Glenn, A. J. Barkovich, and C. Studholme, "Abnormal sulcal formation in fetuses with ventriculomegaly identified by surface curvature mapping from motion-corrected clinical MRI," 15th Annual Meeting of the Organization for Human Brain Mapping, San Francisco, CA, June 2009. Growth of the human fetal cerebellum has been previously estimated primarily from linear measurements from ultrasound and 2D MRI. We have now applied 3D analytical methods - regional volume and local mean surface curvature - to develop normative growth trajectories for the fetal cerebellum. Volumetric growth trajectories showed that the cerebellum is growing relatively faster than cerebrum and the rate of growth is accelerating with age. Patterns of age-related changes in surface curvature describe how cerebellar growth impacts the shape of the structure. K. S. Hamzelou, J. A. Scott, P. A. Habas, V. Rajagopalan, K. Kim, A. J. Barkovich, O. A. Glenn, and C. Studholme, "3D morphometric analysis of human cerebellar development during mid-gestation: an in utero MRI study," 17th Annual Meeting of the Organization for Human Brain Mapping, Quebec City, Canada, June 2011. This work focuses on developing improved methods to map and quantify subtle, focal losses of tissue from repeated MRI scans of an individuals brain anatomy. We use fluid registration based deformation tensor morphometry that allows us to separate regional shape changes (such as the collapse of gyral structures) from true tissue volume changes providing a more direct physical measurement of tissue loss. We have specifically developed new methods of robust fluid registration using regionally adapted mutual information. This allows the separation local changes in tissue contrast (due to disease induced tissue integrity changes) from true volume changes. C. Studholme, C. S. Drapaca, B. Iordanova, and V. A. Cardenas, "Deformation-based mapping of volume change from serial brain MRI in the presence of local tissue contrast change," IEEE Trans. Med. Imaging, vol. 25, no. 5, pp. 626-639, May 2006. 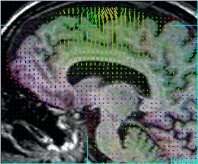 V. A. Cardenas and C. Studholme, "Co-analysis of maps of atrophy rate and atrophy state in neurodegeneration," in Medical Image Computing and Computer-Assisted Intervention, LNCS, vol. 3217, pp. 680-687, September 2004. This work focuses on developing methods to create and statistically analyze maps of tissue volume differences across and between populations of brain anatomies in order to detect characteristic patterns of tissue loss from single MRI scans of subjects. We have developed approaches to fine scale spatial normalisation of brain anatomy, groupwize registration and methods for the analysis of deformation tensor data using voxel-wise general linear modeling. C. Studholme, "Simultaneous population based image alignment for template free spatial normalisation of brain anatomy," in Proc. 2nd International Workshop on Biomedical Image Registration, LNCS, vol. 2717, pp. 81-90, June 2003. 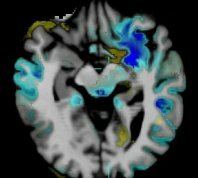 C. Studholme, V. A. Cardenas, N. Schuff, H. Rosen, B. Miller, and M. W. Weiner, "Detecting spatially consistent structural differences in Alzheimer's and fronto temporal dementia using deformation morphometry," in Medical Image Computing and Computer-Assisted Intervention, LNCS, vol. 2208, pp. 41-48, October 2001. C. Studholme, V. A. Cardenas, and M. W. Weiner, "Multiscale image and multiscale deformation of brain anatomy for building average brain atlases," in Medical Imaging 2001: Image Processing, Proc. SPIE, vol. 4322, pp. 557-568, February 2001. A. A. Maudsley, A. Darkazanli, J. R. Alger, L. O. Hall, N. Schuff, C. Studholme, Y. Yu, A. Ebel, A. Frew, D. Goldgof, Y. Gu, R. Pagare, F. Rousseau, K. Sivasankaran, B. J. Soher, P. Weber, K. Young, and X. Zhu, "Comprehensive processing, display and analysis for in vivo MR spectroscopic imaging," NMR Biomed., vol. 19, no. 4, pp. 492-503, June 2006. 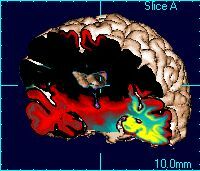 This aspect of our work refines and applies our deformation morphometry methodology to the study of dementia. We work with clinical collaborators to look for patterns of tissue volume differences and changes that are related to basic clinical diagnosis and to cognitive and neuropsychological measures. V. A. Cardenas, A. L. Boxer, L. L. Chao, M. L. Gorno-Tempini, B. L. Miller, M. W. Weiner, and C. Studholme, "Deformation-based morphometry reveals brain atrophy in frontotemporal dementia," Arch. Neurol., vol. 64, no. 6, pp. 873-877, June 2007. C. Studholme, V. A. Cardenas, R. Blumenfeld, N. Schuff, H. J. Rosen, B. Miller, and M. W. Weiner, "Deformation tensor morphometry of semantic dementia with quantitative validation," Neuroimage, vol. 21, no. 4, pp. 1387-1398, April 2004. 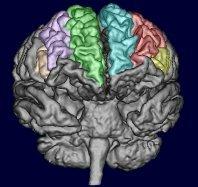 Here we have worked with collaborators studying substance abuse, to apply methods of serial MRI morphometry to create statistical maps of brain volume changes in groups of recoverying and relapsing alcoholics. V. A. Cardenas, C. Studholme, S. Gazdzinski, T. C. Durazzo, and D. J. Meyerhoff, "Deformation-based morphometry of brain changes in alcohol dependence and abstinence," Neuroimage, vol. 34, no. 3, pp. 879-887, February 2007. T. C. Durazzo, V. A. Cardenas, C. Studholme, M. W. Weiner, and D. J. Meyerhoff, "Non-treatment-seeking heavy drinkers: effects of chronic cigarette smoking on brain structure," Drug Alcohol Depend., vol. 87, no. 1, pp. 76-82, February 2007.